Space Shuttle Discovery lifted off from Florida yesterday. European astronaut Thomas Reiter on board is en route to the International Space Station, where he will be spending 6 to 7 months aloft. This long-duration mission will be closely watched by the CADMOS1 centre in France, responsible for monitoring experiments on the station and communications between Reiter and teams on the ground. Space Shuttle Discovery lifted off from Florida yesterday and successfully entered low Earth orbit. ESA astronaut Thomas Reiter is one of those astronauts. He will be joining the other 2 current members of the permanent crew on the ISS, Russian commander Pavel Vinogradov and NASA flight engineer Jeffrey Williams. As 2nd flight engineer, Reiter will be accomplishing a 6-to-7 month mission dubbed Astrolab. This long-term mission will boost Europe’s presence on the ISS ahead of the future arrival of the Columbus laboratory. For the 1st time since the Columbia accident in February 2003, the mission also marks the return to a 3-member permanent crew operating the orbital facility. This larger crew will mean that more time can be devoted to science experiments. While this is the 1st long-duration mission for a European astronaut on the ISS, it is also the 1st for which a European scientific programme has been specifically designed. The Astrolab onboard experiments were devised mainly by European science organizations and encompass human physiology, plasma physics and the study of radiation. 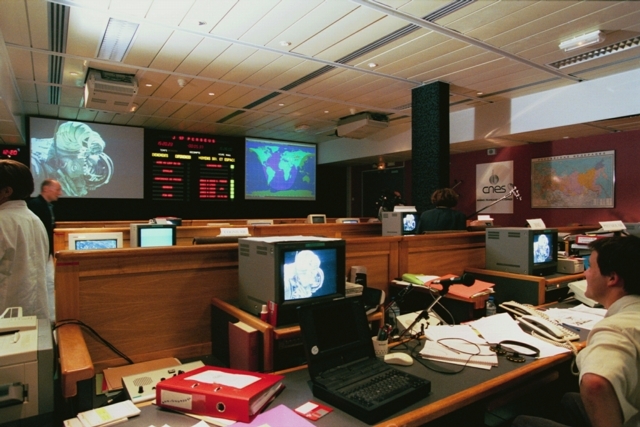 Created by CNES to plan, organize and monitor French spaceflights, CADMOS is one of ESA’s USOCs2 designed to provide back-up to users conducting experiments on the ISS. To this end, it has developed, validated and will be monitoring some of the experiments on the Astrolab mission. CADMOS is also ESA’s point of contact for communications between Thomas Reiter and scientists and engineers on the ground.